Join in for an evening of swing and beautiful vocals to stir the heart. The Broken Heart Trio will take you on a musical tour of lost romance and nostalgia. The Broken Heart trio was formed as a tribute to all with a bruised heart. Songs about love and the absence of it, of hearts and how they can be broken, of lovers and their ruthlessness are being left unsung. If you were ever down and out you must come listen to them. 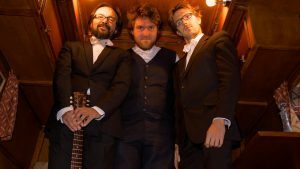 Kevin Van Staeyen (vocals & violin), Ramsy Irani (vocals & guitar) and Pieter Van De Veire (vocals & double bass) will perform songs from the post-war era with humour and wit – think Inkspots, Mills Brothers and Django Reinhardt. Reach us at www.brokenheart.be or come see us perform live!